Don’t let pain keep you from doing the things you love to do every day. With Voltaren Emulgel Extra Strength, you can get 12 hours of freedom from treating your pain. For the first time, the extra strength formula is available as an over-the-counter product. Get relief from joint pain, muscle pain, stiff knees, injured joints, and more. Voltaren Emulgel Extra Strength gives you 12 hours of freedom from treating your pain because it contains twice the amount of diclofenac as Voltaren Emulgel Original. The extra strength formula allows more of the anti-inflammatory medicine to penetrate deep, right at the source of pain. 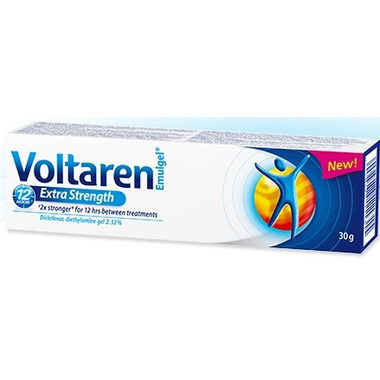 Voltaren Emulgel Extra Strength also has a special permeation enhancer, which assists the diclofenac to pass through the skin faster as compared to Voltaren Emulgel Original. It then creates a reservoir of medicine that is released over an extended period of time giving you 12 hours between treatments. Butylhydroxytoluene, carbomers, cocoyl caprylocaprate, diethylamine, isopropyl alcohol, liquid paraffin, macrogol cetostearyl ether, oleyl alcohol, perfume, propylene glycol, purified water. Gently rub a small amount of gel into the skin around painful or swollen areas. The amount needed depends on the size of the painful areas. After applying the product to the affected area, the hands should be washed unless they are the site being treated. Follow the directions on the carton, insert or tube for detailed directions of use. Until I saw this on the Well.cawebsite, I wasn't aware that Extra Strength was available. I'm glad I ordered this as I'm getting quite a bit of relief from it. We live in a rural area so our stores obviously only stock basic items. I would definitely order this again.